In plain language this would include history books focused on women, biographies of women, memoirs by women, essays by women and cultural books focused on women (body image, motherhood, etc. ), and fiction that examines the place of women in society. I read a lot of books about women, their struggles and triumphs, so this is a perfect way to share, discover and read more books... Hey, I'm a Chick... I get it! not call myself a feminist per say, but if being a feminist means "the belief of the political, economic, and social equality of the sexes" guess I would be a feminist because I do believe we as women should enjoy the same opportunities as men without favoritism... on either side. *Philogynist: read at least two books, including at least one nonfiction. *Bluestocking: read at least five books, including at least two nonfiction. *Suffragette: read at least eight books, including at least three nonfiction. I would love to be a Suffragette! But I'm going to start slow here and be a Philogynist! So, I'll be reading at least two books, including a least one nonfiction book. Alice I Have Been by Melanie Benjamin... Few works of literature are as universally beloved as Alice’s Adventures in Wonderland. Now, in this spellbinding historical novel, we meet the young girl whose bright spirit sent her on an unforgettable trip down the rabbit hole–and the grown woman whose story is no less enthralling. 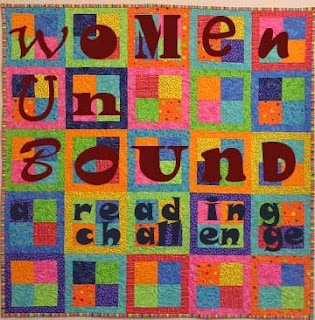 Women Unbound Blog you'll find lots of great book recommendations, so follow the link to check it all out! And a special thanks to the girls who are hosting this, Aarti of Booklust Blog, Care of Care's Online Book Club, and Eva of A Striped Armchair. :) Great answers! Glad to see another person joining the challenge! I just took a peek at your list for the challenge! Love it! I may have to pick up Abigail & John - I remember reading some great buzz about that book! I actually picked up Persepolis last night to read for the challenge and read straight thru til I was done... It was sitting on my shelf for almost a year- the receipt was still in it! :D It was so good, I can't believe it took me a year to get to it! That's what's great about these reading challenges- they motivate you to read the books on your shelves! Yes, I immediately thought Persepolis would fit right in and the challenge just gave me the incentive to crack the spine. I'm glad because it was a great read. When memoirs are done well as a graphic novel they are so good and Marjane Satrapi did it well! The other graphic memoir I just loved was The Impostor's Daughter! I look forward to seeing all your choices! I like the idea of a graphic memoir and sounds like a great book. Good luck with the challenge, I have been tempted to sign up but I worry I won't find enough time. If I did do it I think I would try a few more Persephone titles, I just ordered one which is an early feminist novel called Consequences. Have fun with the challenge. These challenges certainly are a big temptation aren't they! I haven't started my Persephone titles yet- I ordered 3, but may have to consider them for the challenge now that you just reminded me! Giveaway: Dear John by Nicholas Sparks Audiobook! Best Books of 2009... The Lists are out! Giveaway: The Gate House by Nelson DeMille!